We were assigned the task of creating our own mythical creatures at school recently. I have always loved Greek mythology, so I was very excited about this project. While my friends were busy making flying evil dolphins and Medusa berries I thought I would go with something a little less sinister (yes, a dancing leaf). 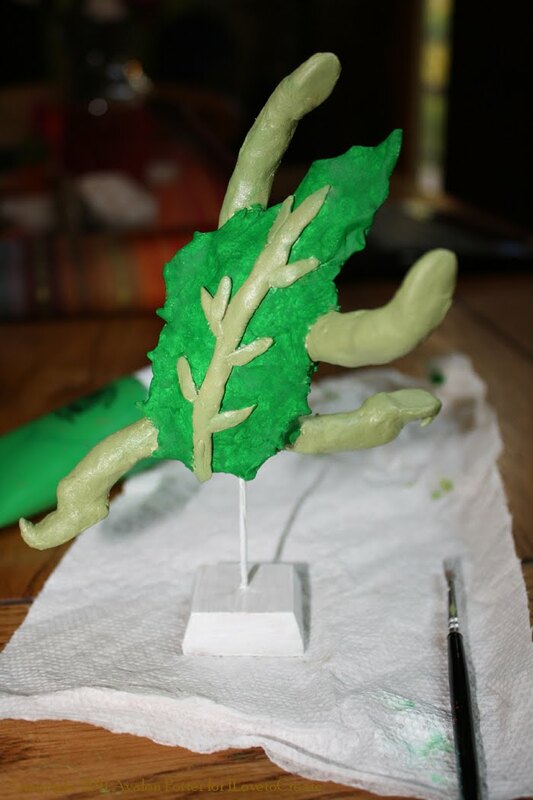 My magical leaf had to be 3-d for my school project so I went out in search of paper clay and a manikin. Once I had finished the leaf I still felt like it needed some thing more, so I thought what better way to give it life then to paint it with Tulip and Crafty Chica sparkles and paints! I had lots of fun making my leaf creature and I hope you do too. 1. Take the mini manikin and position it as you desire. 2. Cover the manikin with a medium to thick layer of clay then cover the torso and head with clay hanging off of the sides to use to form your leaf. On the tips of the feet make a curve to form the elfin shoes. 3. Sculpt the clay on the sides into points in random spots to make it appear like a leaf. Then add a vein with a few smaller veins off the sides running through the middle of the body. 4. Cover the back of the head and the torso with more clay including the clay hanging of the armature. Fill in any cracks. 5. Let the clay dry for one to three days and fill in any cracks as they appear. 6. Get the light green paint and paint the limbs and the vein the light green. 7. Take the dark green paint and paint the torso and head (excluding the vein) dark green. 8. Paint the metal and platform white. Let the paint dry. 9. Take the clear sparkle paint and coat the entire leaf with it. 10. Once the entire armature is dry take the coating and spray lightly over the entire project two to three times. Let it dry and your adorable leaf friend is done.